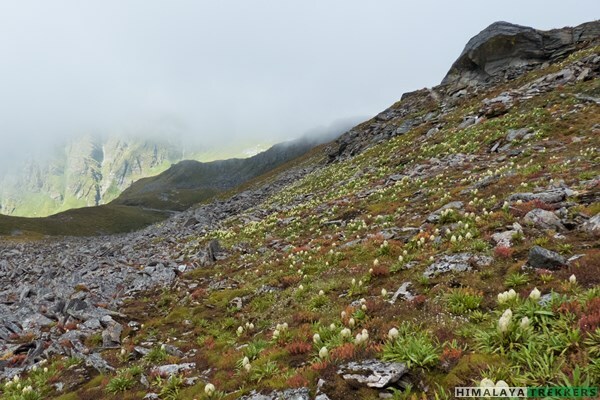 Updates on Roopkund trek (March 2019): As per Uttarakhand High Court order (Petition No. : 123 / 2014) on August 2018, one can not camp on alpine meadows or grassland, locally called Bugyal. Therefore we inform you with regret that we won’t be able to run any Roopkund trek for this season. Check here the notice issued by Principal Chief Conservator of Forests (HoFF), Uttarakhand in accord with the court verdict. On 26th Sep’18 a reconsideration appeal is also turned down by the court and the possibility to arrange Roopkund trek is next to nil. 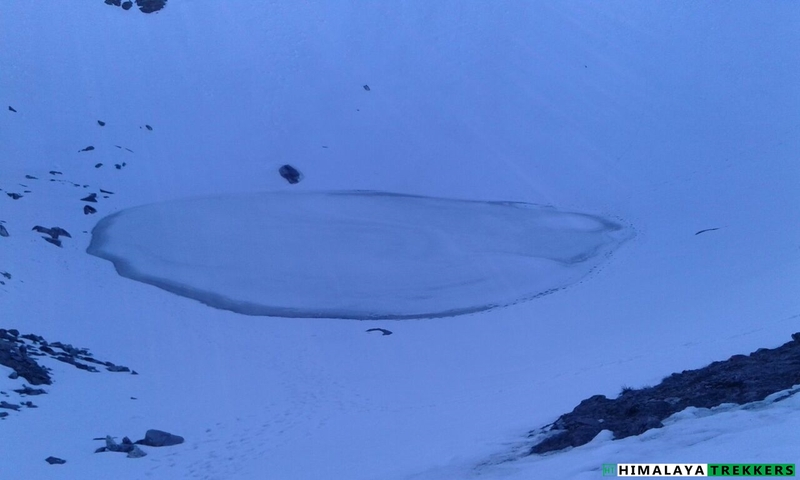 As we update this page on March 2019, there has been no positive outcome on trekking to Roopkund. As a responsible tour operator we are always committed to Green, Eco Friendly treks which are sustainable and have minimal impact on the environment. 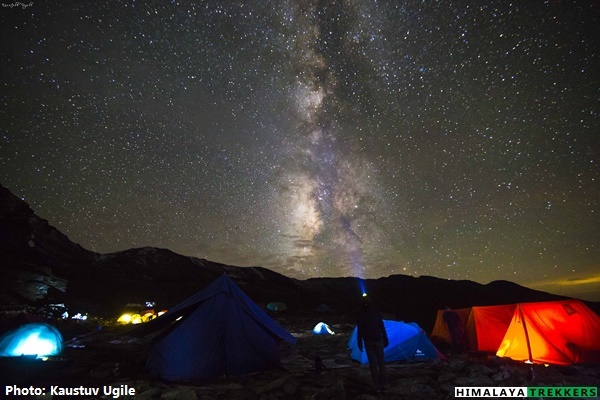 However the honourable court had a different opinion which put a bar on camping at Bedni Bugyal and Patar Nachuni, two back to back campsites on Roopkund trail. In reality this means, one has to push 16 hours or probably more to reach Roopkund from a permitted campsite and return! Who would have thought last summer that this will be the end of it? 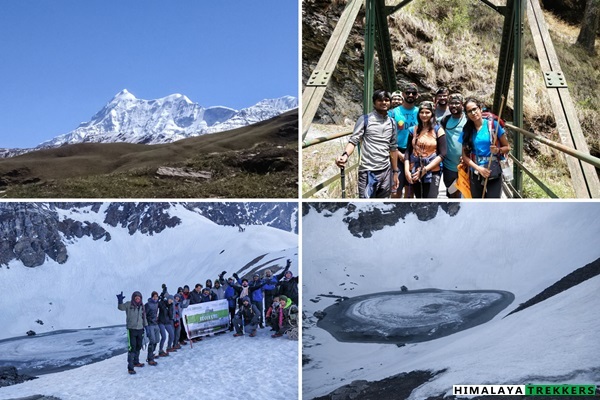 Below pictures are shared by our trekkers during 2018 summer treks. 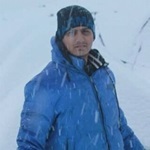 As Roopkund trek is closed, which trek I may consider? It is still possible to enjoy the magnificent peak views and sprawling meadows through our Ali Bugyal and Bedni Bugyal trek. 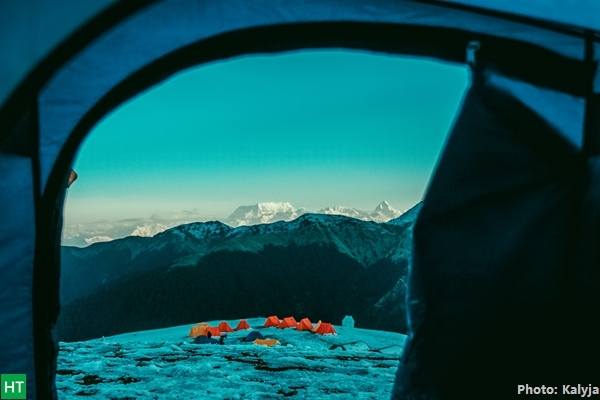 It is true that you can’t reach Roopkund anymore, but you will literally spend two full days on alpine meadows while camping inside jungle. 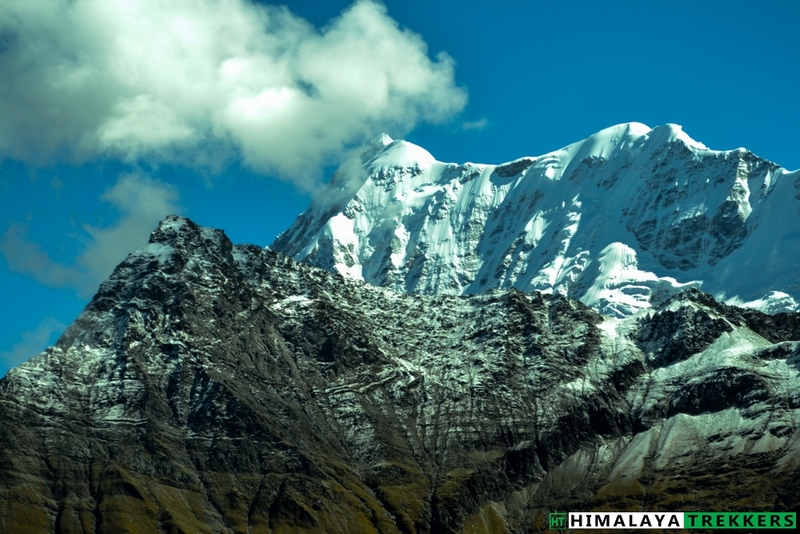 Needless to say that you will get to see all the peaks in this trek as well. 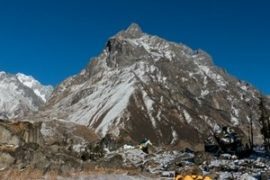 This is certainly a suitable alternate for those who want to avoid large trekking groups during peak season and enjoy the tranquillity of nature. Remember that the proposed trek is shorter in duration, still imposes a “Moderate” trekking grade. Also Check our Fixed Departure Trek Calendar 2019 for a general listing of available treks. 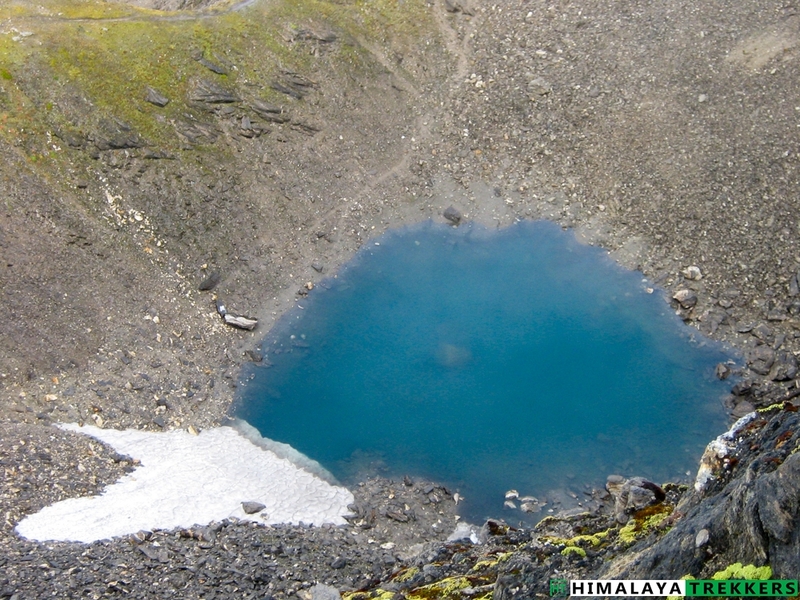 Roopkund an alpine medium size lake, situated at an altitude of 16000 ft inside the district of Chamoli in Garhwal region (State of Uttarakhand), bordering western flank of Kumaon. 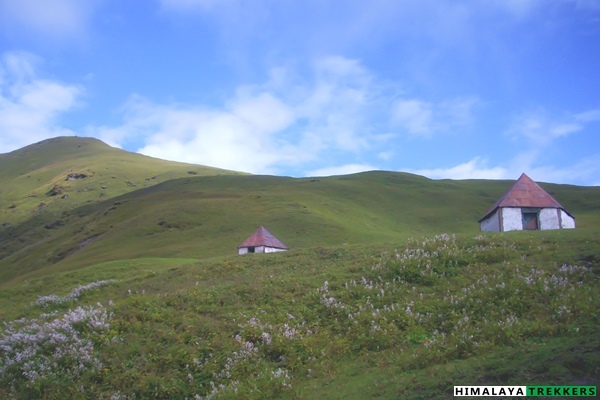 Roopkund trek route has almost everything a high Himalayan trek can offer. Two seasons, first one in Summer/Pre Monsoon ( around two months starting in early May) and the other being Post Monsoon/Fall ( for 2 months, starting from early September) spanning around a window of 4 months in a calendar year. 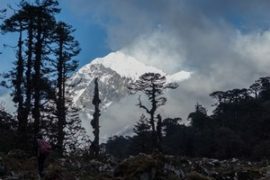 The trekking trail in the lower altitude goes through interior villages, inside the Banj Oak and then Kharsu Oak jungles to finally Rhododendrons. 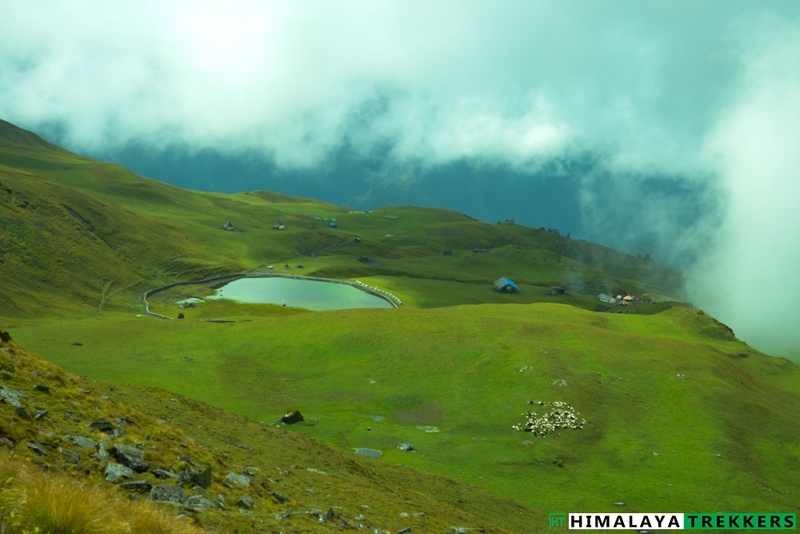 Around ~ 3300 m/11000 ft the Tree Line recedes and alpine meadow or locally called “Bugyal” starts. Sprawling meadow, common to this altitude in Himalaya, but this picturesque span needs a special mention. 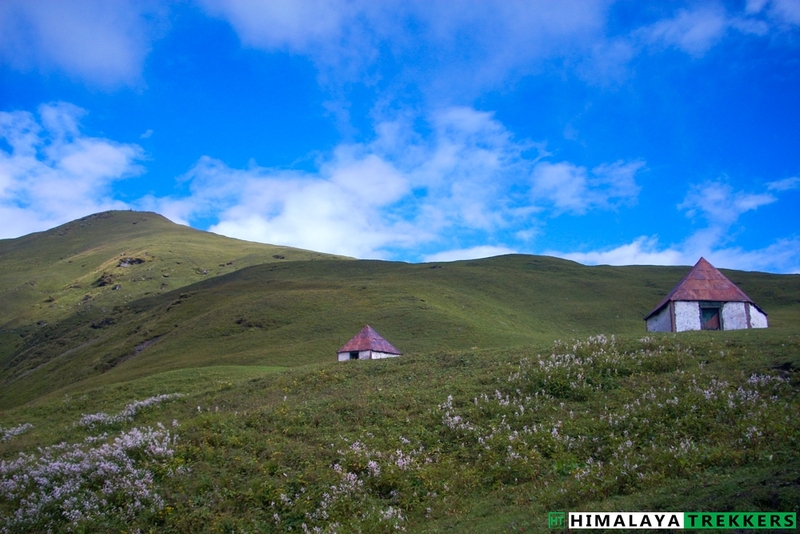 Ali Bugyal, combined with Bedni Bugyal arguably delivers finest of alpine meadows that you can see on the Himalayas. 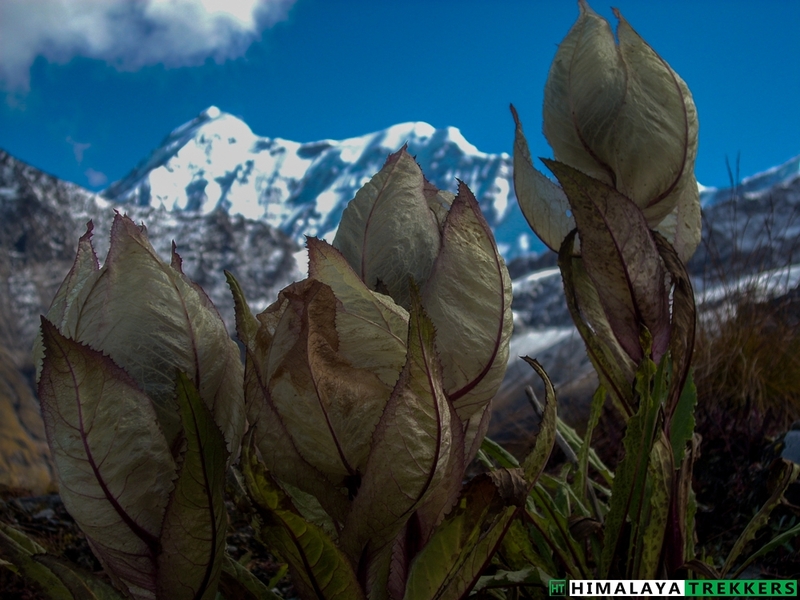 Mighty Himalayan peaks peep behind while tiny little myriads of wild flower carpet the grassy slopes during monsoon . 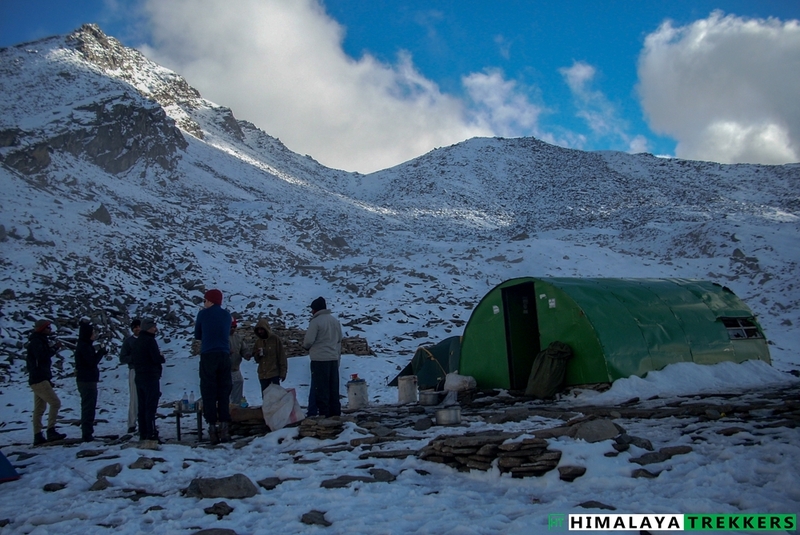 On higher altitude barren rocky terrain coupled with snow and ice ignite the adventurous mind. 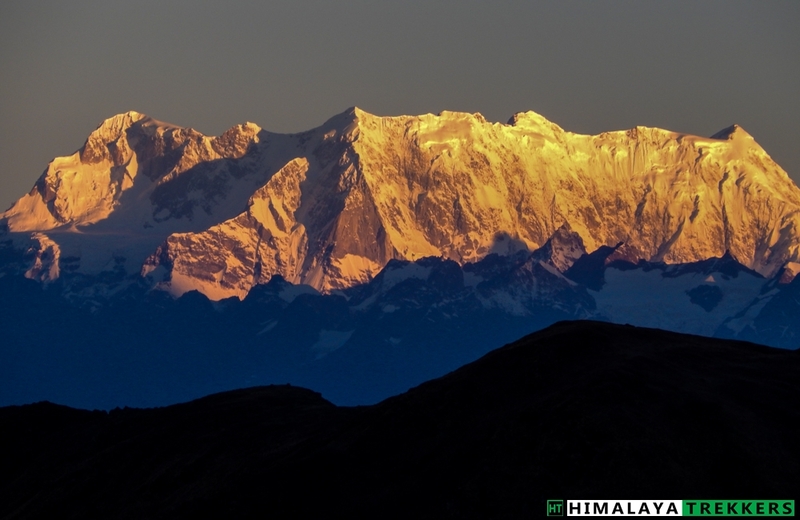 Trishul and Nandaghunti peaks cordon the area while Mrigthuni Chaukhamba, Neelkanth and other peaks set the backdrop. This is not all. 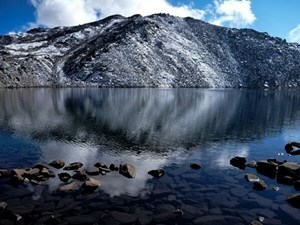 The lake is often called Mystery Lake or Skeleton Lake. Skeletons of over 200 people remain in and around this shallow lake of maximum 2 metre depth. The cold climate helped to preserve the hairs and soft tissues. 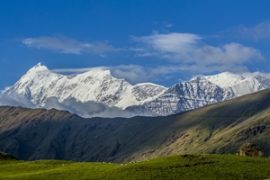 Stories and legends meet to a logical conclusion that a group of pilgrims reached the lake with locals and were crossing the Junargali Pass above Roopkund. Bad weather sealed their fate. 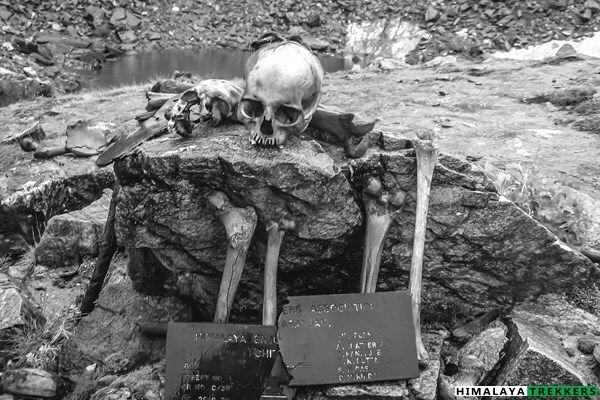 Scientific research unveil that the skeletons are as old as dating back to ~ 850 A.D. ( Source : The Nanda Devi Affair, Bill Aitken, ISBN: 9780140240450; National Geographic : Riddles of the dead: Skeleton Lake). It is truly a fascinating journey to listen the legends from the local and experiencing the present. 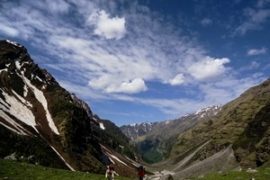 Watch this fantastic short film “Roopkund – Rocking The Himalayas” depicting the journey to Roopkund. This is filmed and edited by Mario Yáñez Aller. He trekked with HT during May/June 2015 season. This is shared for viewing purpose only. This season, weather unusually turned rough during early weeks of May. 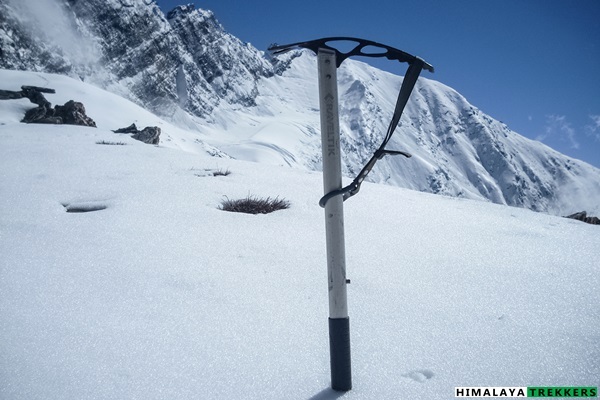 It snowed in first and second week, as low down till Ali Bugyal (~ 11000 ft), accumulating more than one foot of snow at Baguabasa. 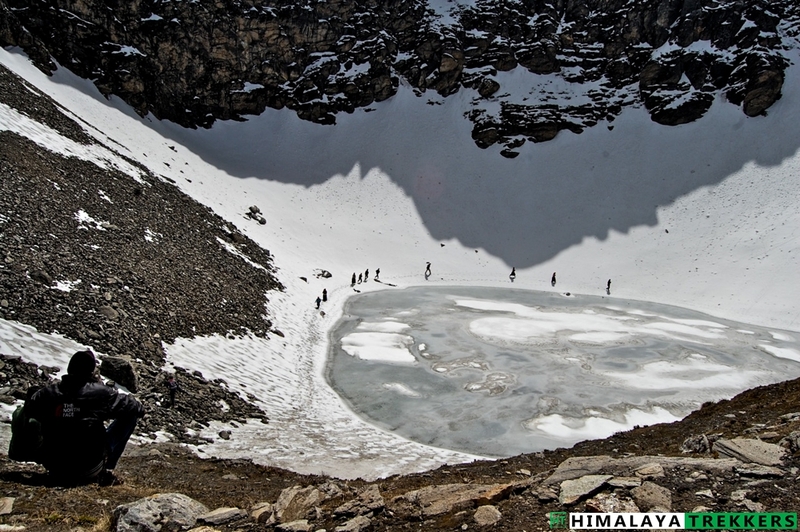 Groups started reaching Roopkund including HT’s only after mid of May. At the end of May snow condition reduced naturally, having 3/4 hours walking on snow, all together. Weather is also cleared up, with great views of the mountains. Some moments from our May teams. We believe that we have the best local support team in the region with whom you are probably safest on the trail. From our inception in 2010 we have arranged this trek and we know the seasonal variations, changing weather patterns and rightly judge the adverse conditions. 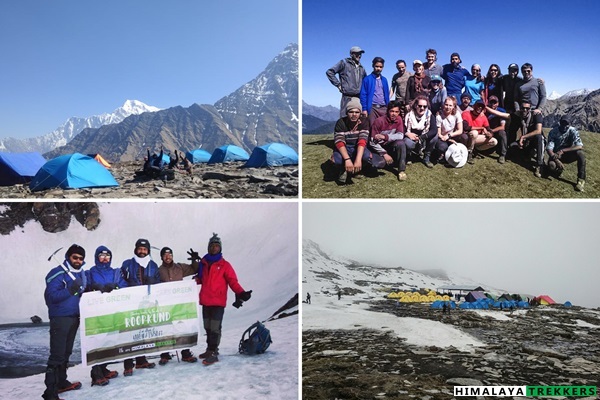 Our group size for Moderate treks like Roopkund is limited to a maximum of 15 trekkers that you can enjoy and at the same time we can manage efficiently. 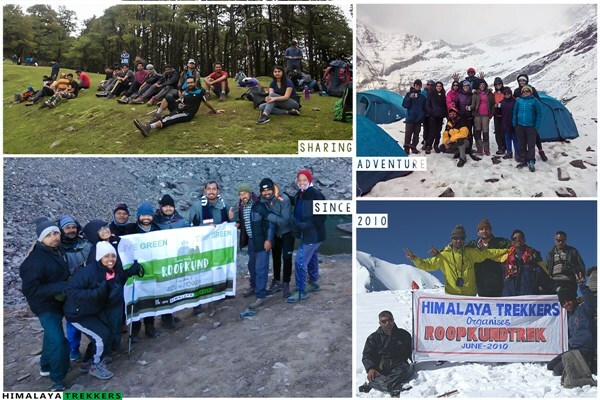 Apart from the standardised camping equipment and medical kit, you are accidentally insured in your Roopkund trek with us. 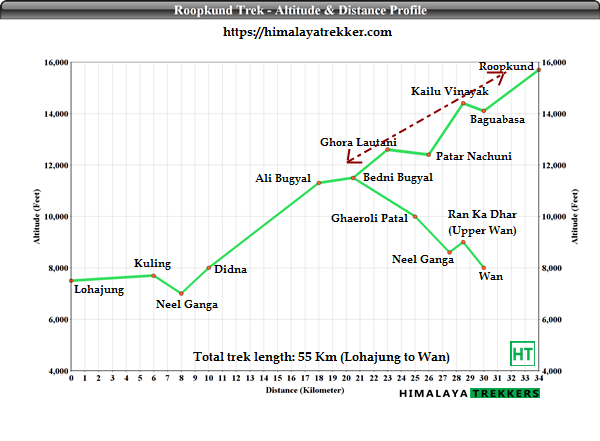 Below is a graphical representation of the altitude and distance of major points on Roopkund trek trail. 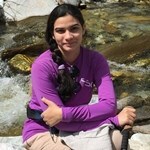 Can I try Roopkund trek as my first hiking/trekking on the Himalayas? And most importantly you need reliable and experienced support team who know every corner of the trail. In high altitude an unexpected weather can increase the risk many fold. 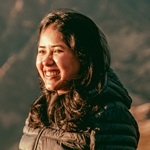 Trekkers who wish to go independently must have an experienced freelance guide and his team to provide support and guidance that you are safely back to trek base. 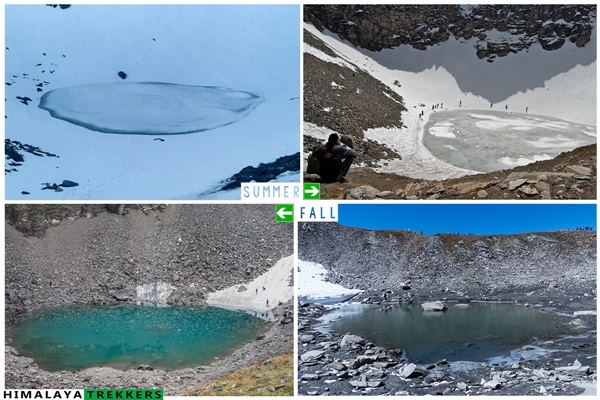 Is Roopkund trek better in Summer (May/Jun) or Post Monsoon Sep/Oct)? We will arrange a pickup from Kathgodam railway station to trek base Lohajung and drop to Kathgodam. This will be shared by the team members on actual basis and paid directly to the driver. his will be shared equally by the team members on actual basis (usually Rs 800/1000 one way). You pay directly to the driver/transporter. The fare is Rs 5500 for a Tata Sumo/Mahindra Maxx one way. This can accommodate 6 to 8 people. A Tempo Traveller charges Rs 9000 (12-14 seat) one way. This is NOT included in TREK FEE. It takes 8/9 hours to reach Kathgodam from Delhi. Book online Volvo/AC bus from Delhi UTC (Uttarakhand Transport Corporation https://utconline.uk.gov.in/). Select Anand Vihar ISBT (45 mins in Blue line metro from New Delhi, NDLS) to Haldwani city, 7 Km before Kathgodam. Reserve an auto rickshaw/shared from Haldwani to Kathgodam. There are frequent ordinary/regular busses by state corporations from Anand Vihar ISBT/Terminal to Haldwani in the evening. Tickets are on boarding. You can get private busses from booking portals. 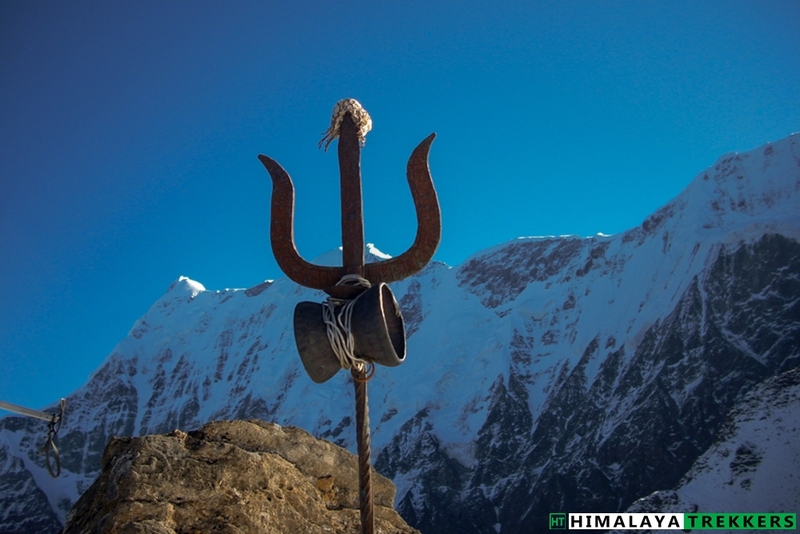 To reach the trek base Lohajung independently/public transportation and more, check the details in GETTING THERE TAB. 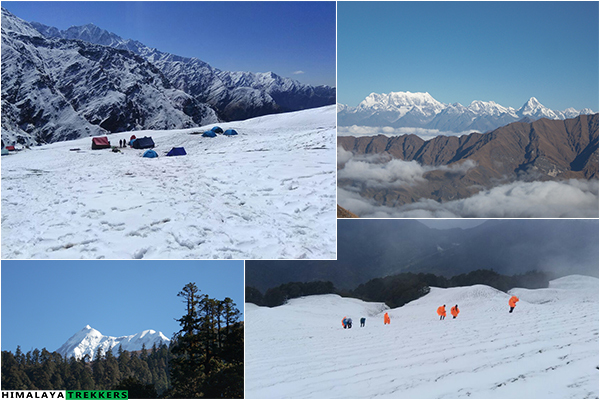 Duration: 6 days of trekking; Walking from Lohajung to Roopkund and back to Wan. 8 days from Kathgodam to Kathgodam. Prerequisite: Prior Himalayan trekking experience is a plus. Specially in the summer/pre monsoon due to snow and icy conditions. 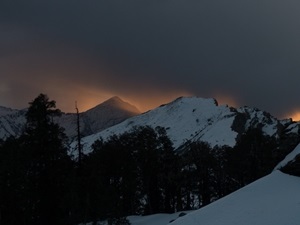 Further Option: From Roopkund climb Junargali and continue to Homkund and finally to Ronty Saddle. Difficult long duration trek. Trekkers need to reach Kathgodam on Day 1 morning (latest by 7 am). Return to Kathgodam on Day 8 evening (7 pm). Arrange your tickets for inward journey and return accordingly. 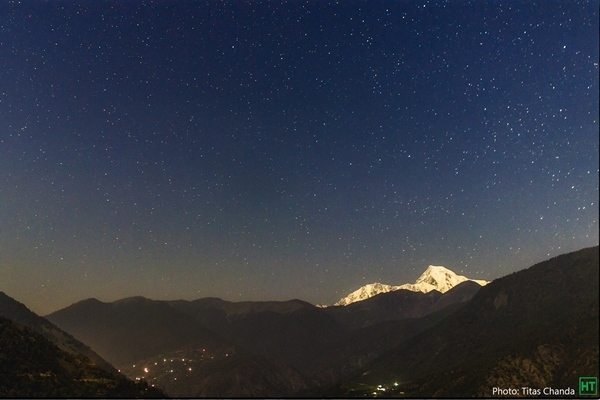 Pickup from Kathgodam in the morning and reach Lohajung (~ 2300m, 7500ft) which is 220 Km away. The journey may take around 10 hours with a break or two. The road is through the Kumaon region and mostly goes along wide spread valleys of Shivalik Himalaya. We cross Almora and Kausani on our way. From Gwaldam onwards the road enters in the Garhwal administrative region and the road is gradually winding and goes through the evergreen montane and conifer forests. The last stretch of the journey from Deval has considerable height gain. 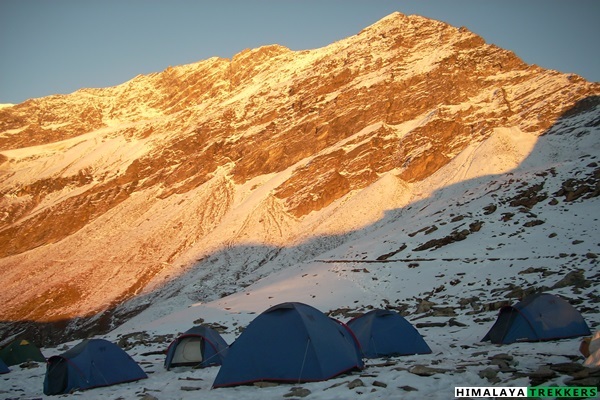 Our Roopkund trek base Lohajung is essentially transit point with a local bazaar and few lodges. Lohajung has one GMVN tourist lodge (TRH), one panchayat Tourist Rest House and 3/4 private hotels. All the major mobile networks have connectivity here. Night stay in Tourist Rest House/Lodge. Our trek starts today morning. After breakfast we walk on the freshly tarred motor able road towards the village of Wan. After walking for an hour and half on the flat surface we reach Kulling at a distance of 6 Km from Lohajung. From here we take a right turn and descend through the village. Initially it is a narrow concrete lane inside the village and cuts along houses and firming fields till we reach a small stream. We descend further till we reach the river bed of Neel Ganga. We cross the cemented bridge and start climbing the ridge on the right side. The ascent is a moderately steep one and ends at the village of Didna (~ 2450m, 8000ft). The trail goes through the sub alpine evergreen forest. After climbing around two hours we reach the top of the ridge and see the firming fields wide stretch on the lap of the mountain with scattered houses here and there. Didna and Kuling village host the same set of people while the prior is used for the summer and monsoon while the later for winter. We reach by lunch time and enjoy the hot lunch after finishing the days trek. Total distance is 10 Km and may take around 4/5 hours. Accommodation at homestay. Today we start early and trek to Bedni Bugyal (~ 3500m, 11500ft) via Ali Bugyal (~ 3450m, 11300ft), one of the most scenically beautiful alpine meadows in Indian Himalayas . We will climb the mountain which sets the backdrop of Didna village. After starting on the trail which goes out of the village we get a bifurcation. The trail on the right is longer but with gentle gradient and goes through a temporary settlement of the shepherds called Tolpani. The trail on the left is with continuous gradient but shorter. Eventually both the trail leads to Ali Bugiyal. The trails consist of thickly vegetation of Oak, Birch and Rhododendron trees. A trek during the late spring is full of red and pink varieties of Rhododendrons. Once we approach to the top of this mountain face the tree line recedes and the grassy slopes start from here. The climb may take 3 to 4 hours. After ascending this face suddenly a wide vista opens up and we are on one of the most beautiful meadows of Himalaya called Ali Bugyal. The far stretched green field clearly resembles the default wallpaper of Mcrosoft XP (if you remember he old days!) . As it is a table top, the clouds start to sell in after midday . Misty Bugyal has its own charm and feeling. We slowly walk on the gentle rolling slopes of the meadow. In summer and especially during monsoon this meadow is full with wildflowers in hues of blue, yellow and white. You can see grazing cattle and horses which will stay here till the end of monsoon. On a clear day one can see the peaks of Trisul and Mrigthuni towering straight. After crossing this Bugiyal we climb a small face and traversing for an hour reach another Bugiyal, our camping ground for the day Bedni. 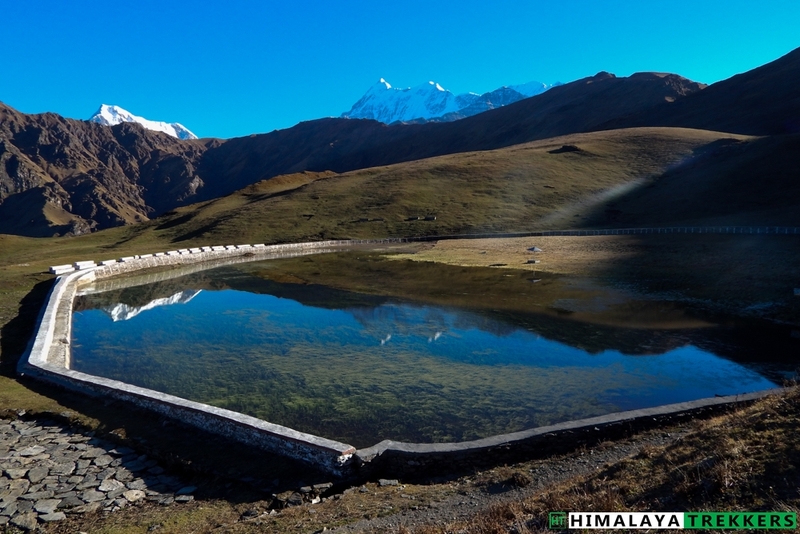 In the afternoon walk around the Bedni Kund and visit the small temple inside the boundary of the Kund. Clear weather will unfold mighty Trisul and Nandaghunti in front. On the other side we can see the panorama of Garhwal Himalaya like Neelkantha, Chowkhamba and others. Total distance is around 12 km and can take 6 to 7 hours. Camp overnight. Today you will hike a short distance due to acclimatisation purpose. From today onward the oxygen starts reducing so we spend more nights before reaching the higher altitude. 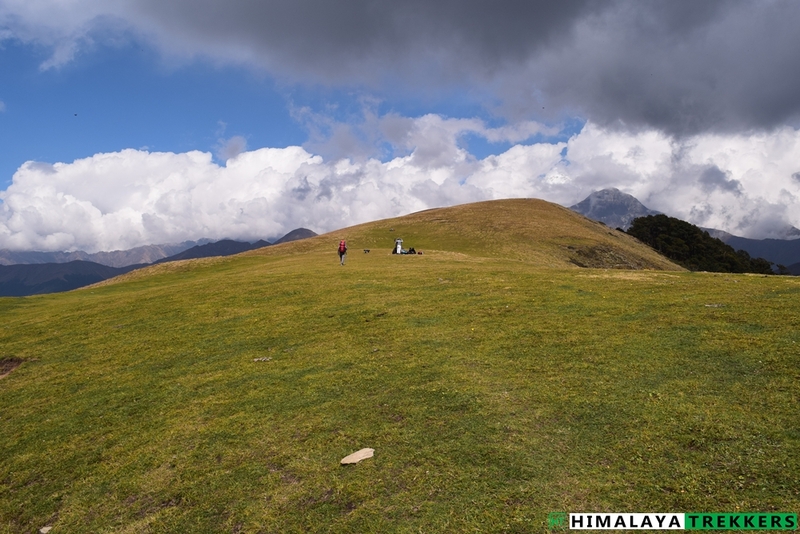 A short and easy walk takes us to Patar Nachuni (~ 3750m/12300ft). Total distance is 5 Km and may take 3 hours. 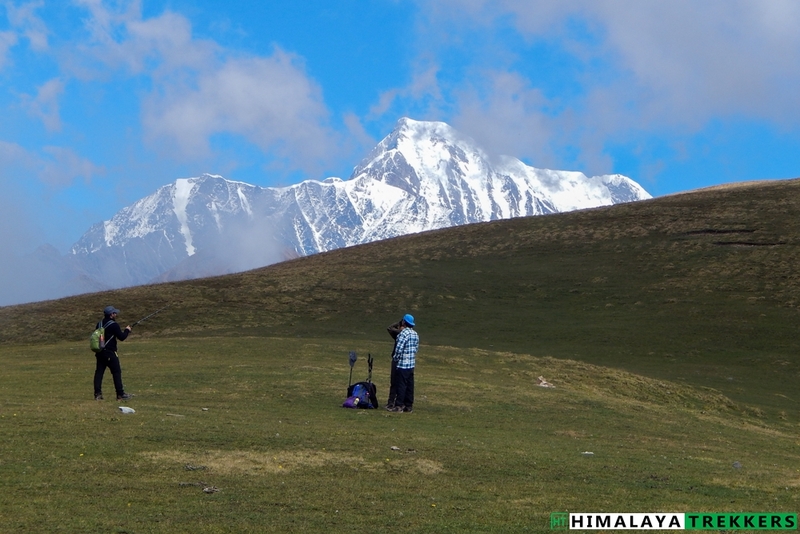 We start by walking on the Bugyal and climb for half an hour to take the trail which is coming from Ali Bugyal. From here onward the road is almost flat till we reach Ghora Lautani. The road splits and we take the trail which goes to the right. Walking an hour on level ground we are at Patar Nachoni. 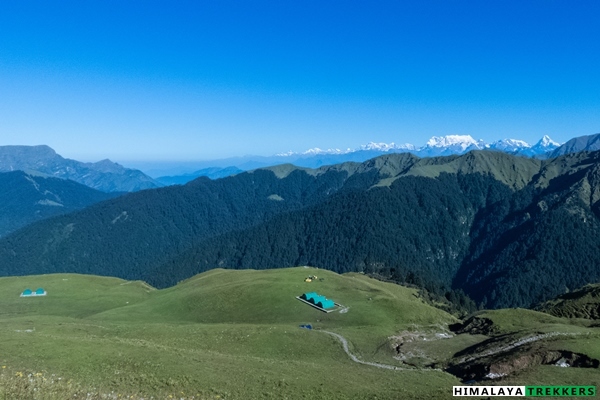 The green fibre huts of the Forest Department is on the left hand side of the trail while the beautiful camping ground is around 200 feet down on the meadow situated in the right. On a clear day the view of Mrigthuni range is magnificent form this place. There is a small shop run by a local in season time inside one of the green hut. It offers basics like tea/coffee, noodles and biscuits. We camp for the night. 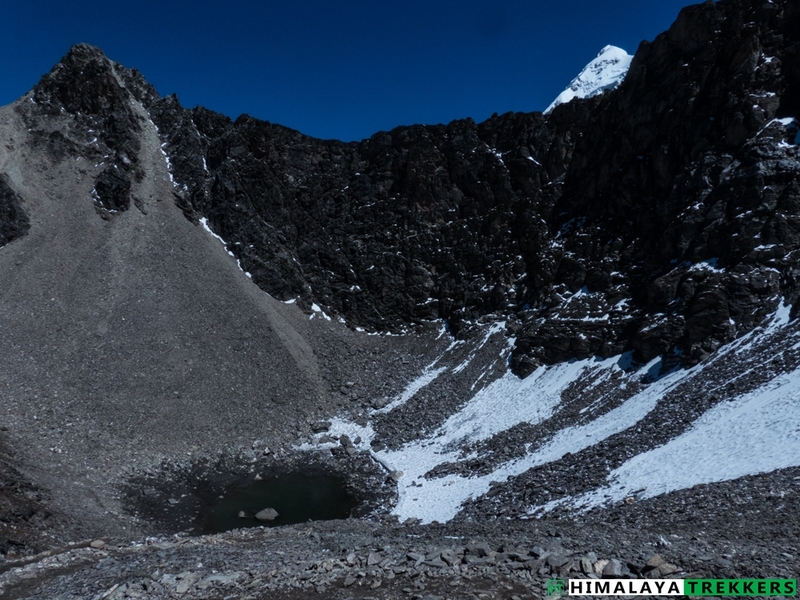 Today we trek to Baguabasa (~ 4300m, 14000ft) via Kailuvinayak(~ 4400m, 14400ft). Patar Nachuni is surrounded by meadows and occasional mountain tops. The top of the ridge going almost straight ahead is Kailu Vinayak. First we gradually climb the ridge for first 2 Km. Then the ridge turns right and rises sharply in next one and half Km. This is a steep climb and we gain almost 1500 feet within a distance of 1.5Km. The ridge goes zigzagging on the gravel. Slow but steadily climb this face without any hurry. The lack of oxygen may result to a headache. Once we reach the top there is small stoned temple of Ganesha with bells clinging to it. The deity is of black stone and thus the place got its name Kailu (Black) – Vinayaka (Ganesha). From here the vista in front widens and first view of the Roopkund area ( the depression of the lake) is visible on the lap of the ridge straight. It is truly mesmerising with glittering Trishul on right and bell shaped Nandaghunti on left at a stone throwing distance! We gradually go down on the rocky trail for another 1 Km to reach Bagua Basa. Total distance is 5 Km and can take up to 3/3 and half hours. 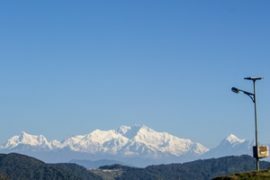 There is a small cave on the right side of the well defined trail, and according to the legend it is the resting place or shelter of the Tiger ( Bagua -> Bagh/Tiger, Basa -> Home) that the goddess Nanda Devi rides. There are green fibre huts also here. The camping ground is also referred as Hunia Thar. This area is famous for Brahma Kamal, blooming in the monsoon. Fen Kamal (Pink) and Neel Kamal (Blue) are two other flower species which grow in this altitude. The flowers remain till early September. 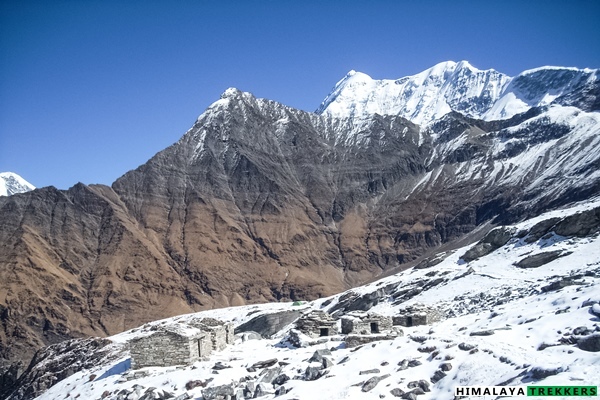 Being at an altitude of 14000 feet the area is rocky and brown while snow clad mountains towering in front. The area is notorious for snowfall. Snowfalls may start even in the month of early June or October. We tent for the night. 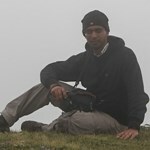 We start early in the morning by 5 am for Roopkund. 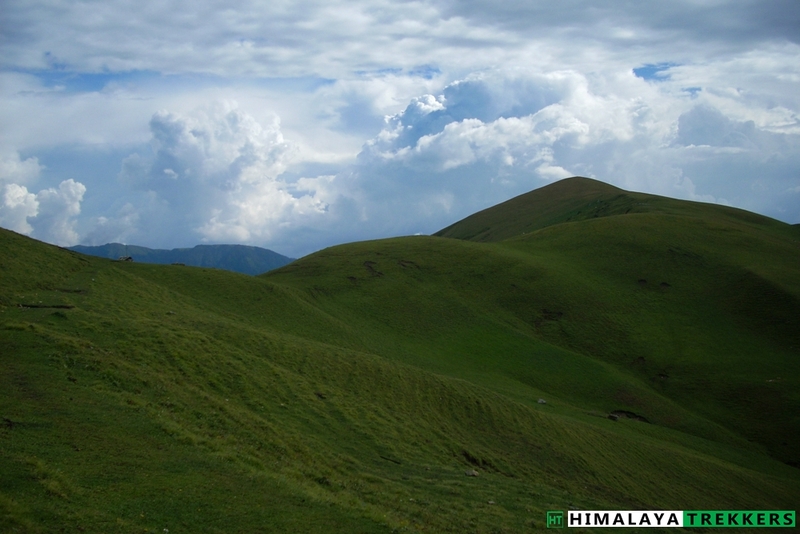 It is a moderate climb to Roopkund for about 4 km but surely the altitude gain tires the body. Depending upon snow conditions it may take 2 to 4 hours to reach. Until mid of June the trail is covered with snow. During monsoon to late September snow will be much lesser. The trail is well defined but on snow it is difficult to locate. From Baguabasa camping ground the trail is a traverse first till we reach a place called Chhiria Nag meaning staircase formation like a snake. From this point the climb is moderately steep and one final steep climb on rock leads us to a flattened trail. Due the Nanda Raj Jat (Yatra) in 2014 the trail has been maintained and in well condition. 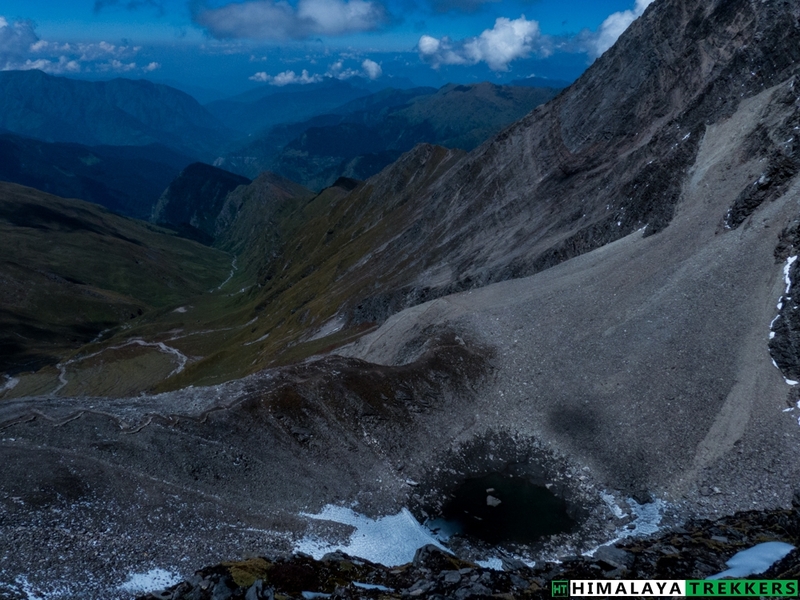 From here we can see the depression ahead which is our destination, Roopkund (~4800m/15750ft). 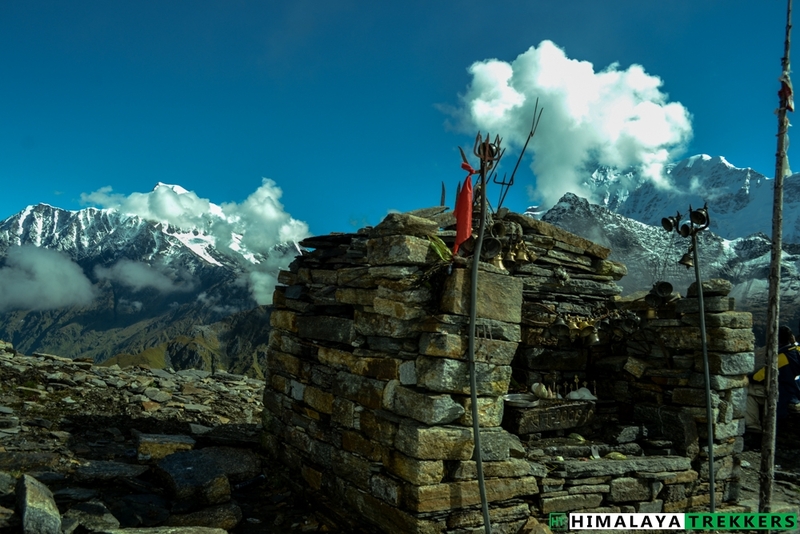 We spend some time clicking the photos and offering puja to the small temple of Goddess Nanda Devi. The shallow lake has remains of skeletons which are almost 1200 years old! There are still remains of semi decomposed torsos on the other side of the lake, which is a permafrost area. Depending upon the weather condition/time and team condition we may decide to attempt Junargali Pass (~ 4950 m, 16240 ft). The pass is between the ridges joining two low altitude peaks, Chandaniya Kot (on the left) and Kali Dang (on the right). Without snow in September it will take 30 to 45 min to reach the top. From Junargali, Nanda Ghunti and Trisul massifs are magnanimous. 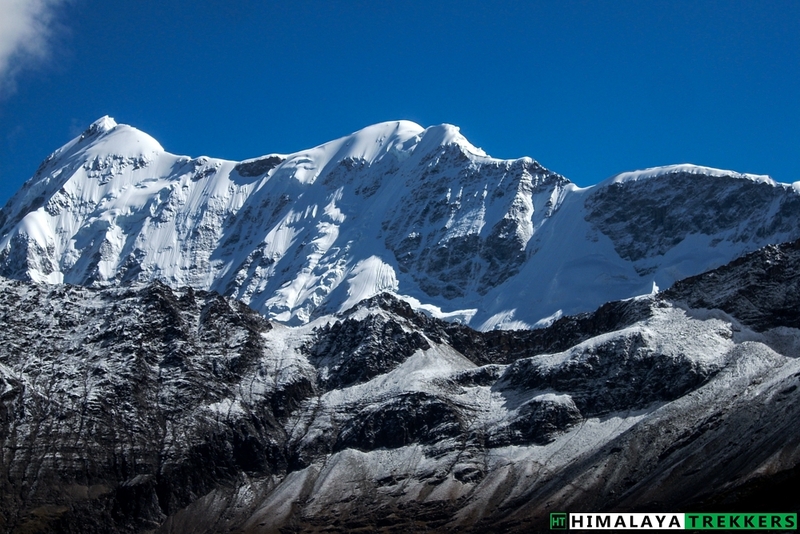 The depression between Bethartoli Himal and Nanda Ghunti is the famous Ronty Saddle. We return on the same trail to Baguabasa. Descend on a steep trail is often tricky comparing to that of ascent. We climb down till Baguabasa and then almost on a level ground till Kailu Vinayak. We continue our descent till we reach Patar Nachuni. A long days trek ends at the lush green camping ground. 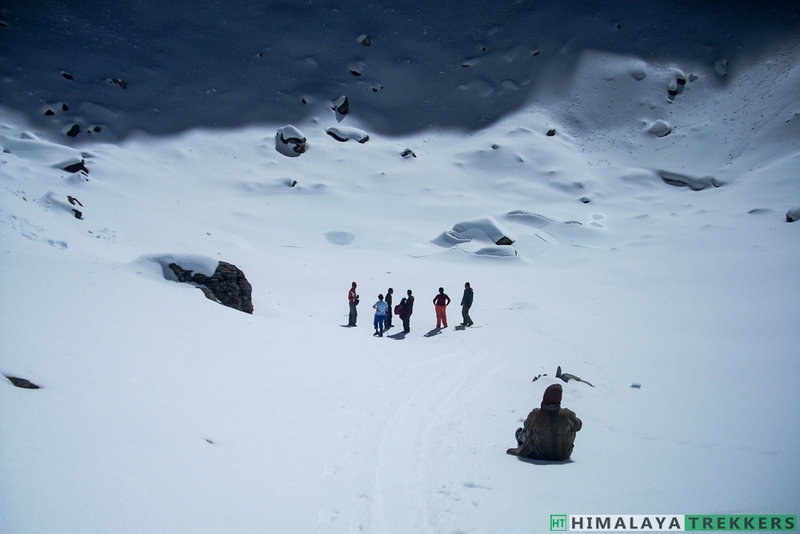 Total trek distance is around 15 Km and may take 8 to 10 hours depending upon the snow condition. Depending on the team condition we may return to Bedni Bugyal. Camp for the night. Today is a long way descending till Wan. From the camping ground a small climb takes us on the main trail. Now we follow the same path back. This feels like a cakewalk after the strenuous day before. We continue our trail back to Ghora Lautani and then to Bedni Bugiyal. After reaching Bedni camping ground we take the trail on the right and is different from the route by which we reached Bedni. Now we go down on the Bugiyal while we see the green fibre huts on our right. After going down for a while the road splits. We take the right hand side trail which goes down and slowly we enter into the tree line again. In few places the gradient down is steep and goes through the forest all the way. Avoid taking the shortcuts as it may hurt your knees. After descending for an hour we reach an opening inside the forest and called Gahroli Patal. We continue going down till we reach the river bed of Neel Ganga. From here we climb to reach the top of the Wan Village which is called Ran ka Dhar. Now we enter into the village of Wan and continue to descend. The village is stretched on both sides of the mountain and indeed huge comparing to normal Himalayan villages. Finally we reach the road head to take the Jeep. Total distance is 17 Km and takes around 7/8 hours. It is around an hour from Wan to Lohajung by car and the road road is bumpy at places. 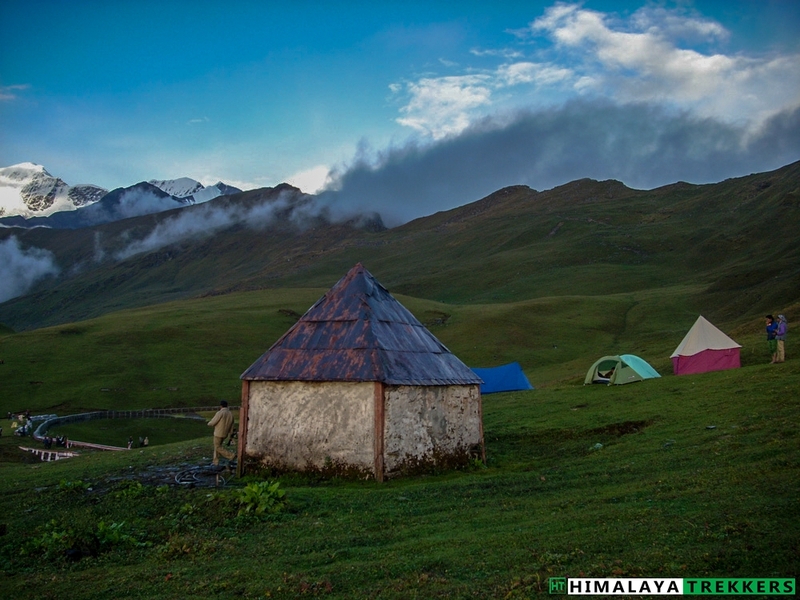 Enjoy the evening at Lohajung while sharing the fresh memories of the trek. Night stay in Tourist rest house/Lodge. In the morning start from Lohajung to Kathgodam by car and reach in 10 hours. Roopkund trek tour ends here. You will reach by 7 pm in the afternoon. You can book tickets accordingly. 2 night’s accommodation at Lohajung (Day 1 & Day 7) in lodge on sharing basis and dinner. Accidental Insurance Policy covering high altitude trekking tours (For Indian nationals it is included in the TREK FEE, up to 60 years of age). Fantastic. Overall package is very good. 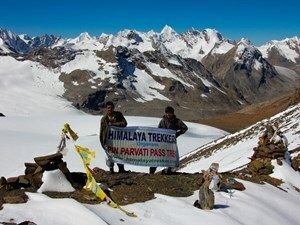 I would like to trek in future with your group. Please send me some information on how can I patch up for a trek on a fixed departure schedule as a single member. One thing I like to mention is that when many groups are trekking on same day and staying at same place. It will lucrative if you spend some money on colourful tent and equipment (like banner, walking stick etc.). Very exciting and thrilling. 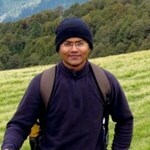 Wonderful experience of the trek and local people. All were very helpful. Excellent support staff with superb behaviour and knowledge especially Dev Singh Ji and Sheru, good food, top guide, good arrangements all around under very tough conditions. Really fantastic experience with Himalaya Trekkers on the Roopkund trek. We were guided through beautiful villages and mountain scenery, enjoyed the company of our guides who shared their stories and jokes with us, finished off the day with an absolutely delicious hot meal, and slept very comfortably in warm tents they provided. 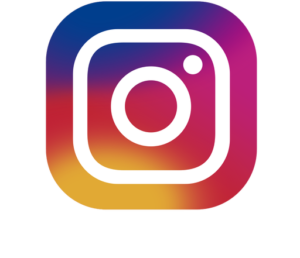 I really can’t say enough good things about my experience with Himalaya Trekkers and I can’t wait to go back! Hiking in the Himalayas was one of the best experiences of my life and I am so glad I chose to travel with Himalaya Trekkers! It is the most comfortable and fun way to experience the Himalayas. It is also an incredible price for the many services they provide during the trek (mules, setting up tents, cooking dinner, help with any odd problem that might arise during the trek). 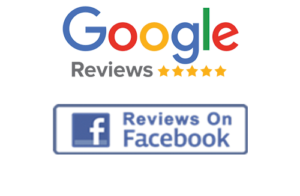 Definitely a five star experience. Hoping to do a longer glacier trek next summer! It was a perfect trekking experience. 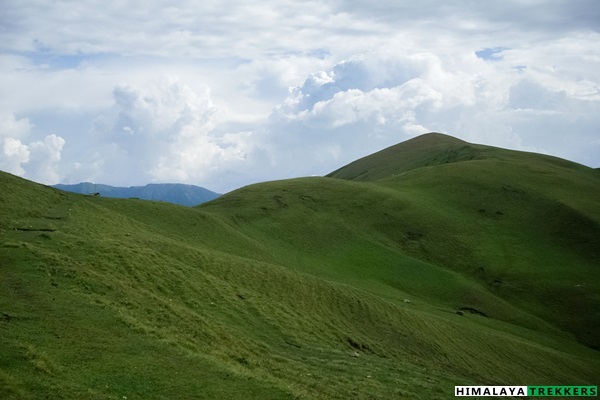 The trek offered all kinds of landscape, meadows, forests, snow; weather varied from rainy to foggy to bright sunny, and the views were awe-inspiring. 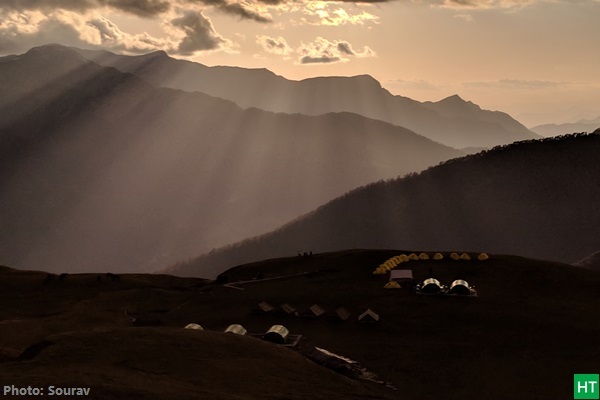 The trek was very well organized; transport was well arranged, food was very good, camping was a comfortable affair, and the support staff was knowledgeable and experienced. I enjoyed every minute of it, and will always cherish it. It was my first trip to Himalayas, and I joined HT for Roopkund trek which takes you to an altitude of 1600 ft above sea level. The route is very scenic. The climb is not a very easy for a beginner – however I received excellent guidance on how to prepare and what to expect. Support and assistance was provided at every stage of the trip, from the very beginning. Importantly, it was a very friendly group. All the staff members in HT proved to be highly experienced, passionate and know what they do. The routes they planned, the meals they provided, the stories they shared with us, the way they took care of the team, the way they encouraged us when the going got tough, – it all made the trek a successful one. And one that I would cherish for a life time! The feeling standing there on that snowy peak is an unforgettable one.. Would love to do another challenging trek with HT another day!